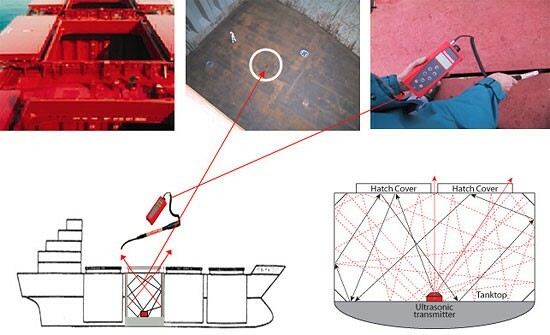 One of the possible applications for using ultrasounds in the marine industry consists of testing the weathertight integrity of hatch covers, weathertight doors, ventilators,… on board of ships. The testing principle is based on the generation of a distinctive ultrasonic signal by using a transmitter (SDT 200mW for small compartments and SDT 8 MS for larger compartments) which is placed inside the compartment to be tested. Through reflection, the ultrasounds generated by the transmitter will fill up the cargo hold. Ultrasounds passing through sealing arrangements, cracks, holes etc. can easily be picked up and measured by the SDT Sherlog ultrasonic receiver equipped with a handy flexible sensor. Reliable, Non-destructive, repeatable testing method. Detection of areas where lack of compression exists with pin-point accuracy (no time consuming investigation needed for finding the leaks, as the leak can be pin-pointed local repairs might be sufficient and adequate,….). Quick and easy testing, without assistance from ship’s crew (except for supervision and safety aspects). Possibility to use the equipment in holds loaded with water susceptible cargo. Possibility to test hatch covers irrespective of weather conditions. Testing for weathertightness and air/gas tightness. Identification of leaks without the use of a transmitter (on condition that the compartment tested for leaks is pressurised (air escaping through small openings, cracks etc… will cause disturbance of molecules/friction which creates ultrasounds that can be detected)). The Class Type approved SDT Sherlog TA allows easy operation and can be used by qualified operators and approved Class service suppliers, surveyors, ship’s crew, repair yards,… in order to determine areas where lack of compression exists.